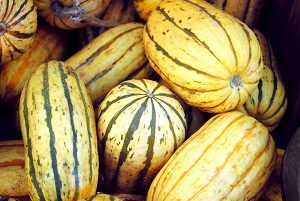 Also known as Bohemian squash or sweet potato squash, delicata has a rich yellow flesh and a buttery, sweet-corn like taste. The skin is edible and delicious as well. Low in calories and high in fiber, delicata is a good source of vitamin A. There are so many ways you could flavor this squash. Below are a few of my simple favorites. Wash the squash thoroughly. Cut the hard ends off each squash, and cut them in half. Using a spoon, scoop out the seeds and strings. Cut each half into 3 or 4 wedges. 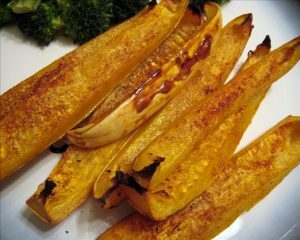 Place the squash wedges skin down on a cookie sheet. Spray with cooking spray and sprinkle on your seasonings.